The first Possibility Screams event of 2019 kicked off in style at Unity Grill Ayr on Friday 22nd Feb. It was a spectacular night, standing room only and the people that came were a very enthusiastic crowd. I had eight performers of various ages and all were just brilliant. Emily Best made a very strong start with three fantastic original songs which blew everyone away. She was so good. Hannah MacDonald treated the crowd to some beautiful guitar work on the original song Don’t Blame yourself and also showcased her lovely voice. 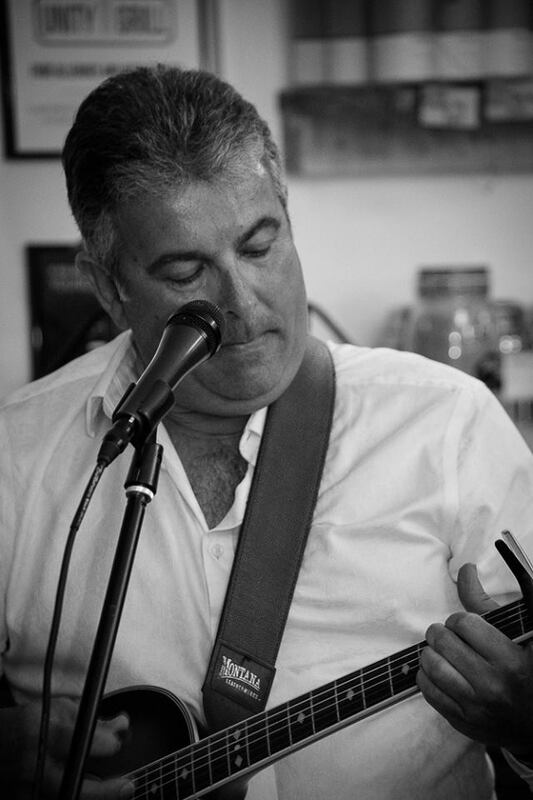 Colin Hyslop rocked the place with his version of Johnny B Good. This ‘mature student’ held the crowd with his wit and charm. He is a seasoned singer but this was his first time playing guitar while singing... he smashed it. 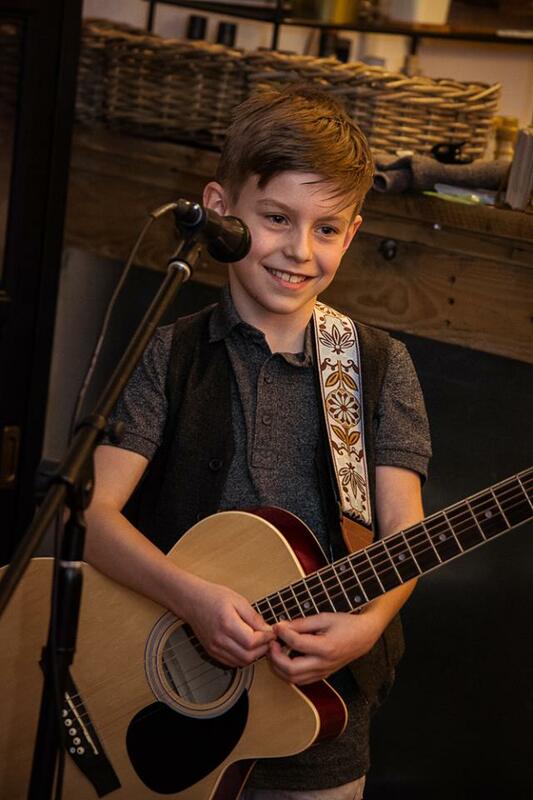 Next up was Rory Turner playing his first gig at the tender age of 12yrs… he was a natural and showed deft touches on the song Happier and we had everyone clapping along and just loving it. Olivia Campbell played keyboard and sang three terrific songs. She has a very powerful voice and it was nice to hear the piano between all the acoustic guitar music. 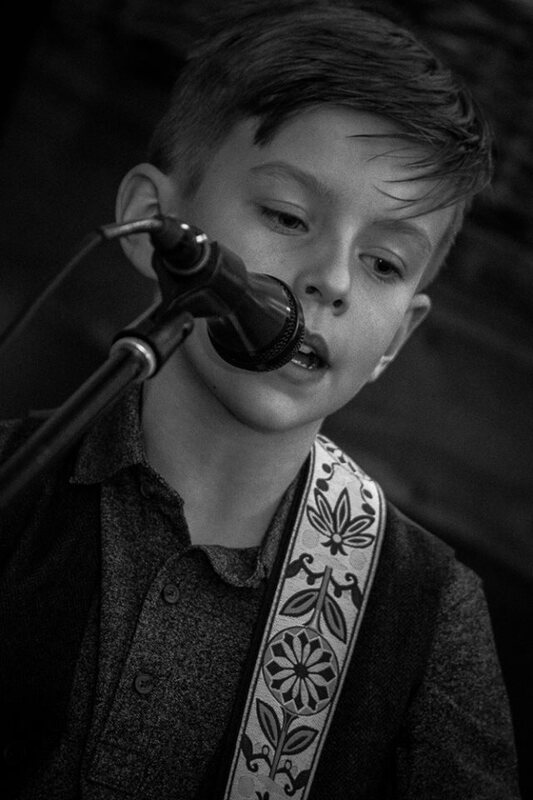 The youngest singer/guitarist of the night was 9 yr old Connor Hunter. He was magnificent and courageous and the crowd just loved him. Olivia Hay played a three song set and she brought joy to her performances. We had everyone singing along to I want it that way. Her closing song was a barnstorming version of Seven. The crowd went wild… Last but certainly not least was Ryann Alexander... like Emily at the start, Ryann closed the show very strongly with a fantastic choice of songs and finished with the original Steal my crown which sent the crowd into the night knowing they had just witnessed great talent and names we could be hearing much more of in the days to come. Thanks to everyone who came and especially to Unity Grill for allowing us to host the gig. Watch this space for more events in 2019. May 13th 2018 was the date for the Possibility Screams Showcase at Studio by Dermalounge in Prestwick. It was a beautiful, sunny Sunday afternoon, the doors were open and the music drifted onto the street. The sun shone but the young Artists lit up the venue inside with their unique brilliance. Stephanie Lynch, the owner of Dermalounge kindly allowed us to take over her wonderful salon for this sensational gig. Lori Smith / Evie O’Hagan Hughes / Catching Fireflies / Hannah and Abigail Thompson-Brooks / Hannah Macdonald / Ryann Alexander were all excellent in their own individual style and performance of covers and original material. Great maturity from these young artists. We had a really good turn out and the crowd were very supportive and enthusiastic. It was also wonderful to have Martin Bone Photography with us and Euan Ruddick from Ayrshire Daily News and also Tamara Campbell from Spin Admin. All filming and taking great shots for promotion. Thanks again to Stephanie Lynch for her generosity and open heart and allowing us to play at Dermalounge and we wish her all the best for the future. Sunday 6th November proved to be a memorable day as the debut CD by ‘Possibility Screams’ was released to an enthusiastic audience at Elliots, Prestwick. The venue was packed, every artist was incredible and I felt very privileged to be a part of such a successful evening. Emily Rutter kicked it off in real style with her original piece, We Are Bright”, which contained the brave lyrics, “we are stars of the future”. These words became a prophetic call across the evening as, one by one; we watched these young performers light up the stage. Every artist performed two songs on the night and almost all of these were their own work. Michael Crawford rocked the house with some great electric guitar licks and we introduced guest vocalist Jeremy Levif, who was sensational as he sang on Michael’s ‘Song For The Future’. Charlotte Rutter was sensational with her two songs and her voice was flawless throughout her performance. Lori Smith has such a powerful voice; she stunned the audience when she took to the stage and sang with calm assurance. Fraser Maxwell dazzled the crowd with lovely acoustic guitar work, as Jeremy came back up to join him on his second offering, ‘Endless Journey’. Evie O’Hagan Hughes lit up the room with her two songs and shone particularly brightly as she poured her heart out on ’Losing You’. Guest vocalist Aimee Penman beautifully sang Shirley Husband’s poignant ballad, ‘Holly Blue’ - it was a real tender moment during the evening. Aimee also sang for Scott Hewitt and was excellent. Scott showed deft touches on his guitar and alongside another wonderful guest vocalist Marc Evans closed the show with energy and fun on the final album track, ‘Wasteland’. Special mention must go to Erin McNair, from the band ‘Rubicon’, who played fantastic percussion for the acoustic acts during the evening. Some of the proceeds from the album sales will go to the wonderful charity ‘Cash for Kids’. It was great to see some of their team having fun. Thank you to all who came, played, sang and made it a brilliant night to remember! You can download the album now from iTunes. Sunday 26th June saw the latest Possibility Screams event unfold in its usual style. The combination of a beautiful location in Elliots, great acoustics, an enthusiastic crowd and incredible young local talent made for a wonderful occasion. Somehow, the performers seemed more confident which was fantastic to see. Ayrshire brother and sister group ‘Rubicon’ opened up the show in style. With acoustic guitar, vocals, bass and percussion they are the whole package. They made a fine job of the cover versions that they played, before performing a great rendition of one of their own songs. It was the first time that I had invited them to play and they did not disappoint. 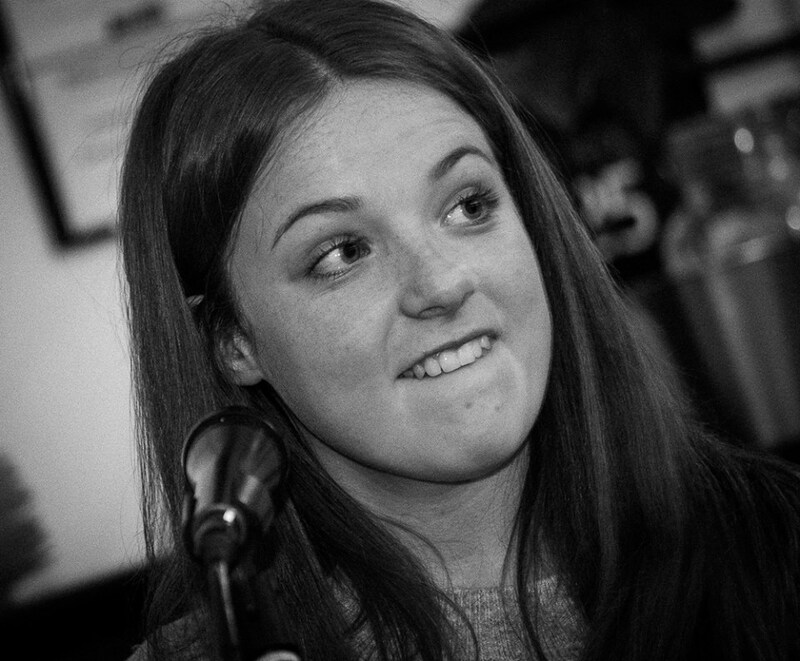 Next, Charlotte Rutter sang four songs with flawless ease and her two original tracks held the audience captive. She has an amazing career ahead of her. Michael Crawford took to the stage, beginning with an original track, ‘Song For The Future”. The crowd loved his energy and clapped along to his rock and roll style. Emily Rutter performed next, bringing her usual hush to the room with her heartfelt song ‘Unique”. She went on to play two more of her own songs, accompanied by our resident percussionist for the day, Brian Fleming. Like her sister, Emily’s talent is sure to shine through in the future! 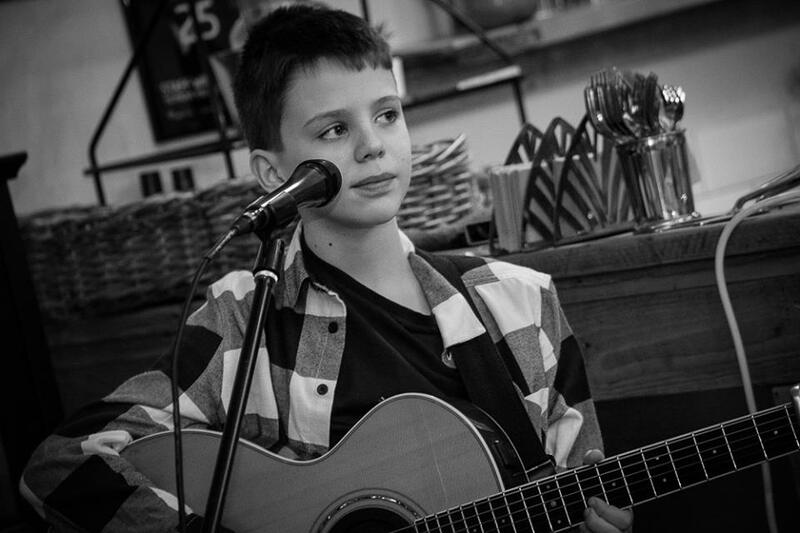 Leo Stack has such a sweet, beautiful voice and he melted hearts with his sensational rendition of ‘Say Something’ and ‘Riptide”. This is another young man to look out for as he has something really special about him. 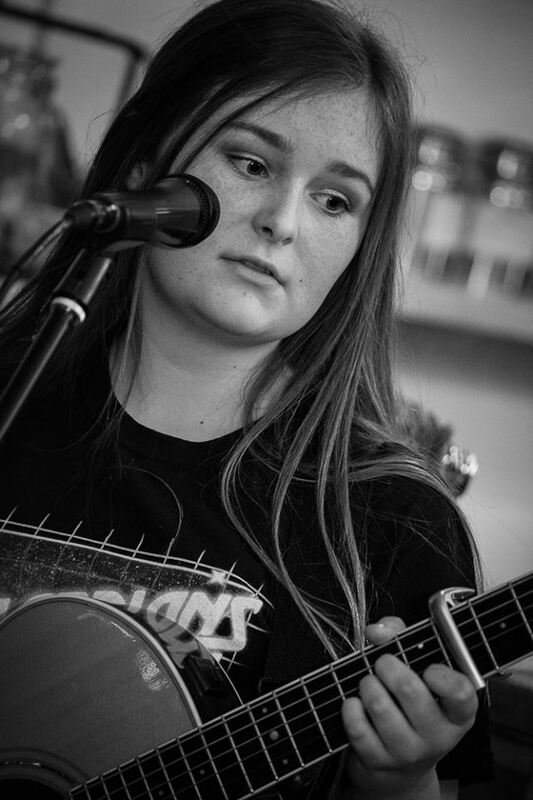 Evie Hughes sang four songs to acoustic guitar and a percussion accompaniment. She made a bold start with her original song ‘Losing You’, displaying a lovely tone to her voice. Her covers were equally lovely and as she finished with ‘Valerie’, she had the crowd singing and clapping along! The crowd were great during the gig, really supportive and no less so for Fergus Miller when he rocked them with three original songs and impressed with his solos. They clapped along enthusiastically to almost every note on his hooks, appreciating his originality. Last, but certainly not least, was Lori Smith who shone and impressed as usual with her vocal range. Lori sang four songs, two of which were original. They sat perfectly with well-known covers showcasing her talent both as a writer and a singer. It’s worth mentioning that all the performers with Possibility Screams are between the ages of eleven and fifteen years old. It’s truly wonderful to be a part of their journey and see them grow in confidence as they develop their stage presence. I am so excited to see what they do musically in the years to come. Thanks again to Buzzworks for having us. You can find us next at The Longhouse on Titchfield Street, Kilmarnock at 1:30PM on 24th July – please come along to support us! Events run by Scott Nicol and Possibility Screams are truly special. 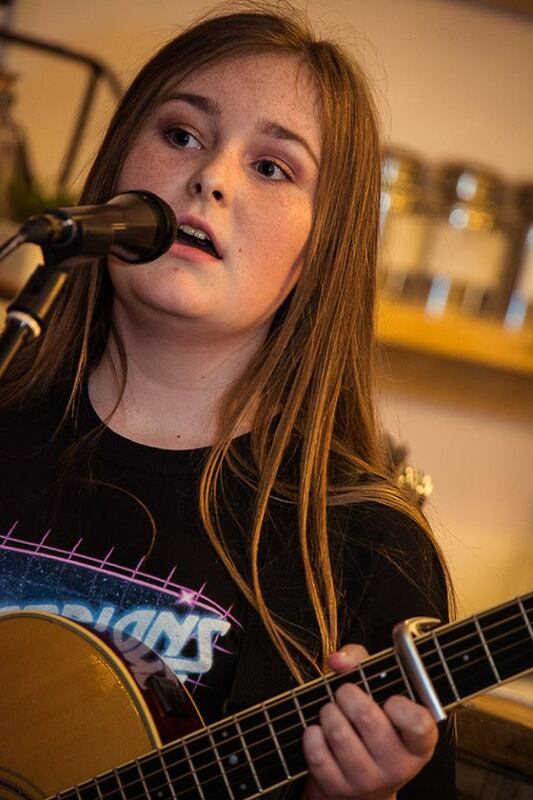 In Murray’s Café, on Sunday 29th May, a packed venue was treated to a show where an ever-expanding band of young performers put aside their fears, drawing us into a joyous display of talent. What makes these occasions so special and uplifting is that Scott gives these young people the confidence to find their voices. 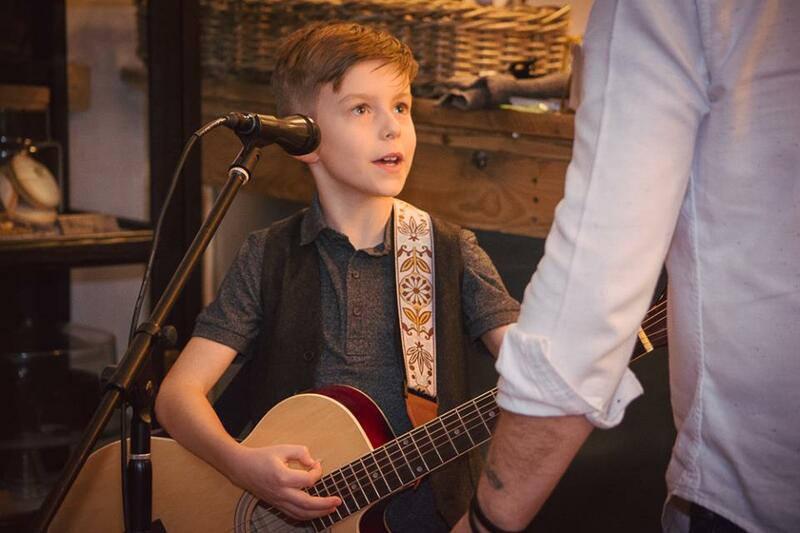 It’s not easy getting up in front of an audience at their tender age, but with a little bit of encouragement and a large dose of inspiration it’s amazing the emotion that comes from their young voices and their music. Some artists - because that’s what they are - I’d seen before. Livi Cameron was exceptional and looked far less nervous, building on her fantastic reception at the Treehouse in Ayr. She is extremely talented and so expressive with her clever lyrics, never missing a beat. Lori Smith, the rising star of the group, has been busy. Still at primary school, she’s released her second original song and is enjoying herself performing regularly under Scott’s watchful eye. She sang her songs ‘The Stepping Stones of Life’ and ‘Ain’t That Far Away’, followed by two cover versions, but her voice is so rich and soulful it was like hearing them for the first time. Michael Crawford was understandably nervous as he made his debut. However, he bravely took his courage in both hands and won over an audience who couldn’t fail to be impressed. After all, it’s every boy’s dream to play an electric guitar like that, isn’t it? Next came two newcomers to the group, Leo and Elliot Stack. These boys are self-taught musicians, but word is spreading about Scott’s ability to nurture young talent. Leo sang with such emotion, sweetness and expression, we were utterly enthralled by him. He really is one to watch. His older brother Elliot played his acoustic guitar skillfully and naturally. He was completely unphased by his audience and a joy to witness. Emily and Charlotte Rutter followed with the enchanting ‘This is Gospel’. These girls are beautiful singers and perfectly in tune with each other. Emily sang her own song ‘Unique’, which was extraordinary – it gave me that little shiver that you get in the presence of something rare in a singer. There is so much emotion in this young girl. Her other original song, ‘Off you go’, will undoubtedly appeal to her peers. It has been written with a sweet maturity and insight into teenage relationships. 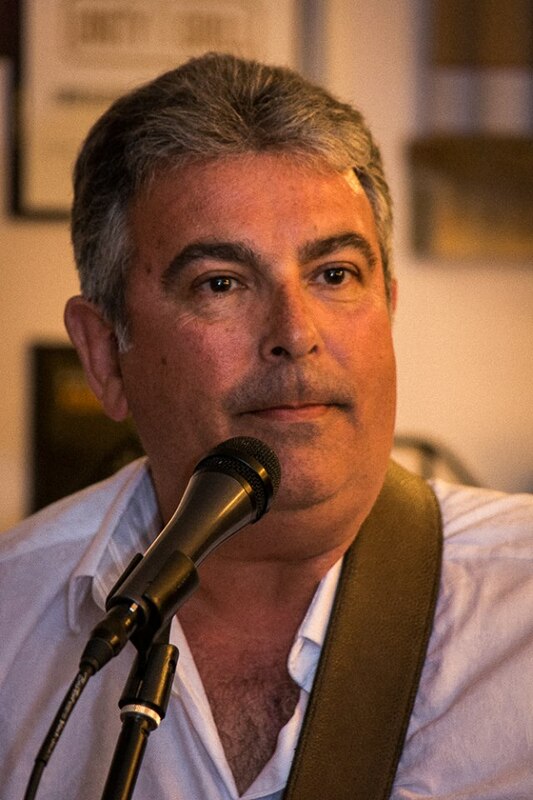 Scott Hewitt played his song ‘Wasteland’, assisted vocally by the elder Scott. I loved ‘Turquoise Sea’ which transported us to white sands and a reverie of relaxation. Scott then played his ‘Jazz Piece’ before letting us hear ‘Living Hell’, based on the refugee crisis. This young man is not afraid to say what he thinks and has a social conscience. It was wonderful to see him tackle such a heavy subject so conscientiously. The music rocked on with Fraser Maxwell and Scott Nicol taking us on an ‘Endless Journey’, which was full of clever rhymes and rich language. ‘In the Woods’ made everyone smile, while Fraser stayed cool and full of youthful enthusiasm. 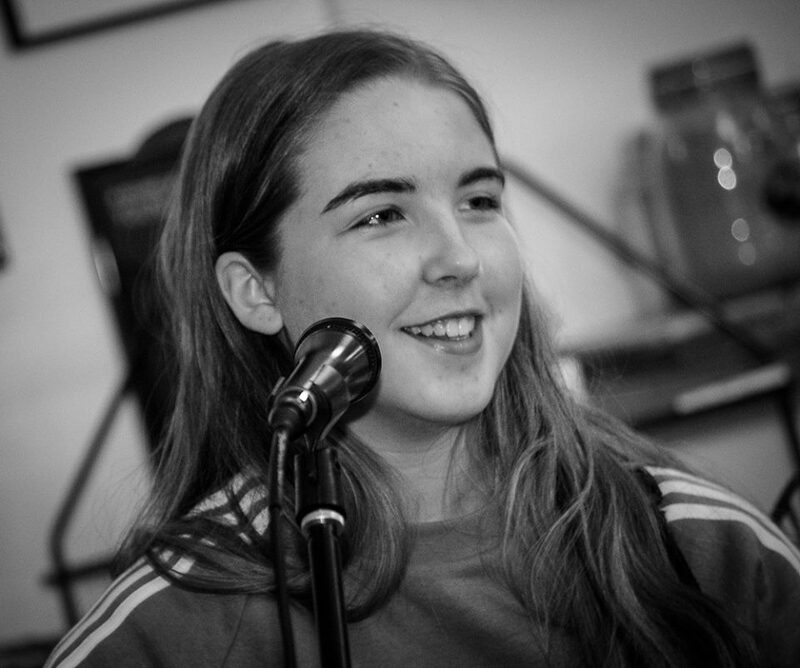 Vocalist Evie Hughes treated us to Adele’s ‘Rolling in the Deep’ and James Bay’s ‘Let it Go’ this week, finishing on the classic ‘Hallelujah’. When asked, Emily Rutter stepped up to close the show, singing just as beautifully as before. Throughout each performance - capturing the spirit of Murray’s Café - a quirky Highland cow in a bowler hat smiled on and the faces in the café were alight with pleasure and pride. Strings of fairy lights twinkled and hospitality flowed. There is a sign over the archway in the café that reads, ‘Friends Gather Here’. I don’t think I need to say any more - Scottish warmth and creativity were perfectly in tune and at their finest. You can see Scott Nicol and the incredible young people of Possibility Screams again at Elliot’s, Prestwick on 26th June. On Sunday 15th May, Possibility Screams played loud and clear at the Treehouse in Ayr. Thanks to a bright, relaxed and welcoming venue, ten young performers between the ages of eight and sixteen were able to showcase their incredible talent. The youngsters, all from across Ayrshire, varied greatly in terms of experience, but all of them made me extremely proud and amazed their audience. Livi Cameron kicked things off in style with four thoughtful and very original songs, showing real maturity and skill. She reminded me of a young Alanis Morissette - full of angst and with her very own genius. 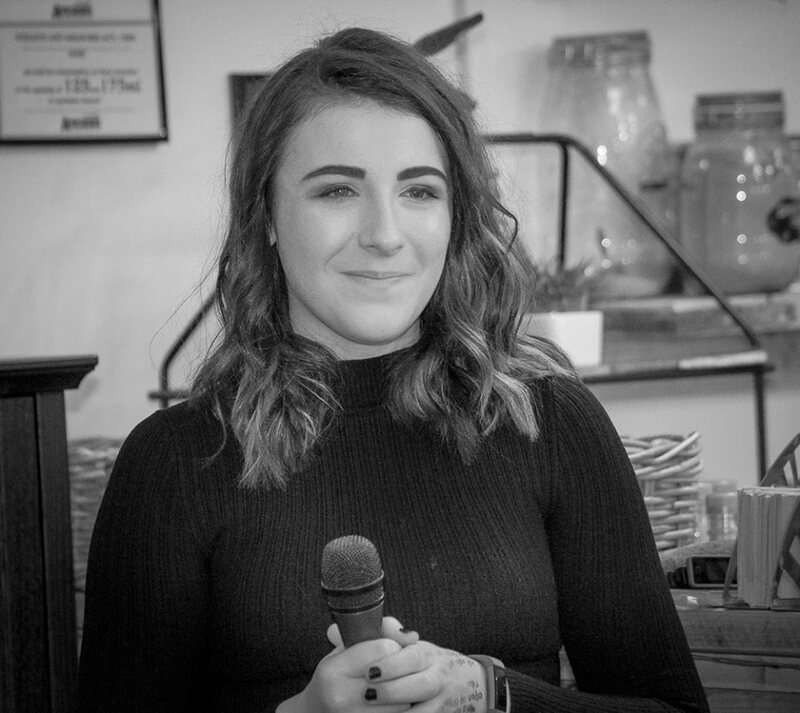 Evie Hughes followed, singing three beautiful cover versions before taking her courage in both hands to charm us with a very successful acapella version of a Whitney Houston classic. Our youngest performer, Erica, then took to the stage with an adorable version of a song from the musical Matilda. Lori Smith enthralled everyone with her powerful, soulful voice. 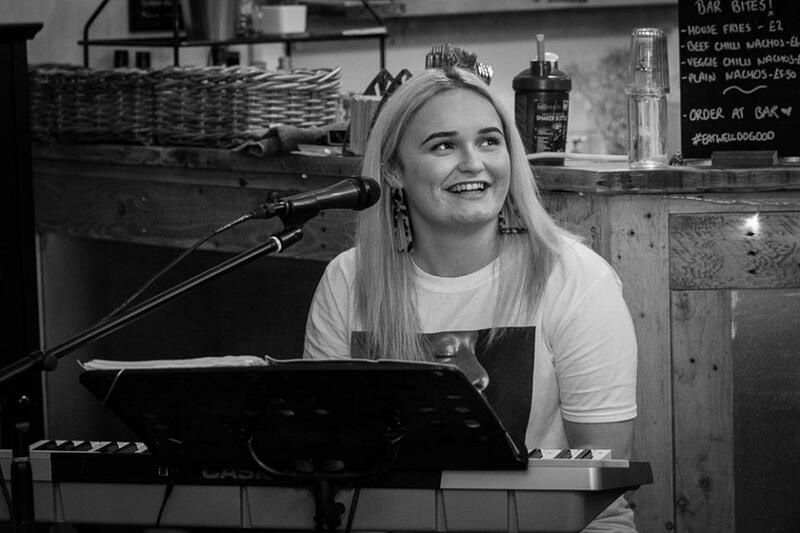 She showed real confidence in opening with her brilliant original songs, before creating a fantastic buzz with two very well known pop covers, alongside her friend Charlotte Rutter. Charlotte went on to sing a beautiful rendition of her own song, ‘Part of Me’, which held her audience spellbound. Her Adele cover took bravery but she proved herself up to the challenge. Her sister, Emily Rutter, gave a magnificent performance of her own heartfelt song ‘Unique’ and the frivolous ‘Off you go’, before launching into rousing versions of ‘This is Gospel and ‘Hallelujah’. We really needed to have some guys on the stage too and thanks to the talented Fergus Miller we were able to bring some Green Day style swag with two original pieces, filled with fresh guitar hooks created by Fergus himself. 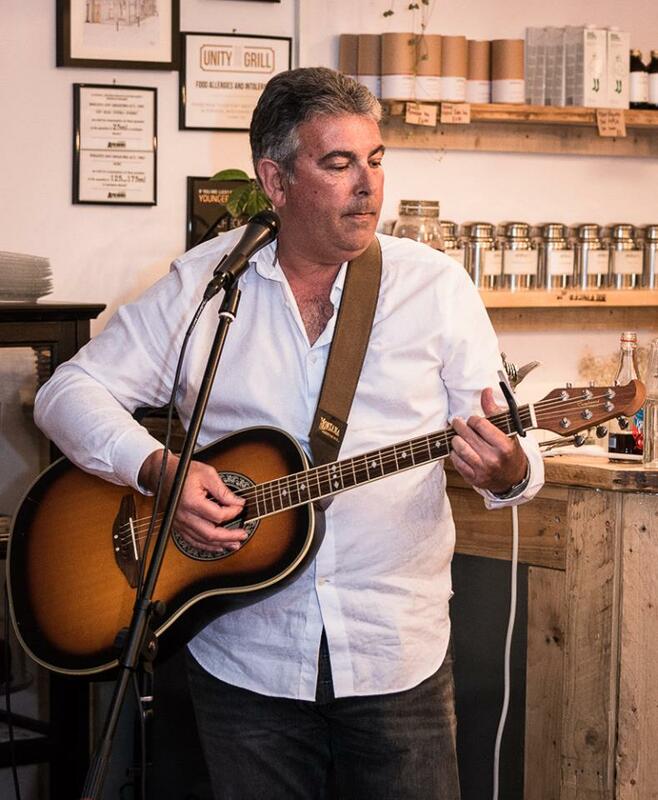 Scott Hewitt brought depth and maturity with his song about the refugee crisis, as well as setting the crowd clapping to his ‘Jazz’ piece; before closing with the wonderfully titled song ‘Bridge to Nowhere’. Fraser Maxwell played his guitar with a passion for two of his own songs and the crowd loved him. He has a real sense of where he wants to go and directs and guides his songs so well for someone so young. Last, but certainly not least, Rebekah Kirk closed the day. This fifteen year old is already an artist and with her wonderfully individual look and musicality her own songs stood shoulder to shoulder with any cover she played. It was a fantastic day and these young performers were all truly wonderful and an inspiration to other young people. It was a great opportunity for us to show a supportive Ayrshire public just how much talent and enthusiasm they have and to encourage them on their musical journey. Thanks again to Conor Kelly and to Buzzworks. 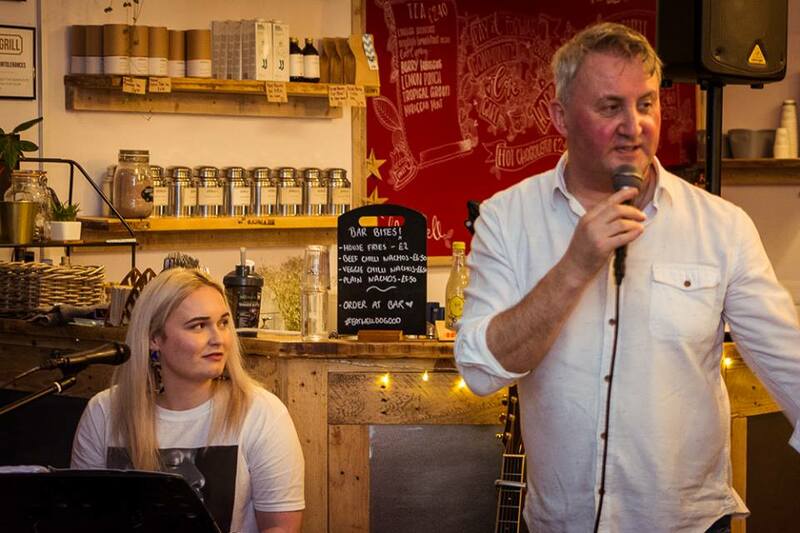 Please come and see us on Sunday 29th May at 2.30pm at Murray’s Café, Prestwick, where we’ll bring possibility screaming – most tunefully - to Ayrshire once more!